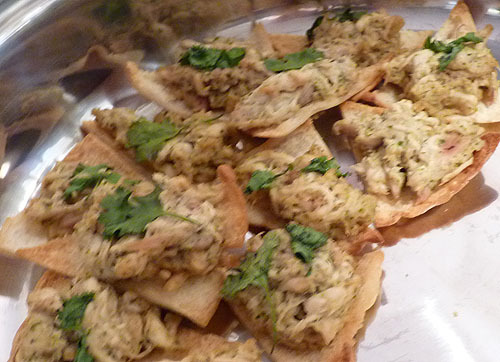 Another recipe from Madeline for our Susan G. Komen event; delicious warm bites of chicken on a crisp pita chip. Tear each pita wedge at fold to form 2 triangles. Brush rough sides of pita triangles with 1 tablespoon oil and toast on a baking sheet until crisp and golden, 8 to 10 minutes. Pulse peanut butter, chopped cilantro, lime juice, water, ginger, Tabasco, salt, and remaining tablespoon oil in a food processor until combined well but still slightly chunky. Toss chicken with peanut sauce and season with salt. Mound on pita toasts and top with cilantro leaves. Serve warm.